Candles appear at a makeshift memorial for rapper Nipsey Hussle in the parking lot of his Marathon Clothing store in Los Angeles on April 1. Hussle was killed in a shooting outside the store. LOS ANGELES — Nipsey Hussle’s public memorial service kicked off with songs from his latest Grammy-nominated album, “Victory Lap,” as family, friends and 21,000 others filled the Staples Center to honor the rap star’s life and legacy. Indeed, his mother, dressed in all white, danced in the aisle in tribute to her son as R&B singer Marsha Ambrosius sang the Mariah Carey song “Fly Like a Bird” while fighting back tears. “This is for Nipsey, y’all” Ambrosius said before she started as she tried to gain her composure, sighing heavily. A montage of photos featuring the rapper from infancy, childhood and adulthood, with fellow rappers, his family and fiance actress Lauren London, were shown to the crowd, set to Frank Sinatra’s “My Way.” Anthony Hamilton invoked the spirit of a church service as he performed in Hussle’s honor. Nation of Islam leader hailed Hussle’s ability to bring different factions together. And blogger and media figure Karen Civil read a letter sent by former U.S. President Barack Obama. Hussle was slain last month in front of a store that he tried to use to empower his South Central neighborhood. Most who filed in for the public memorial at arena Thursday were young adults, but ages ranged from small children to the elderly. 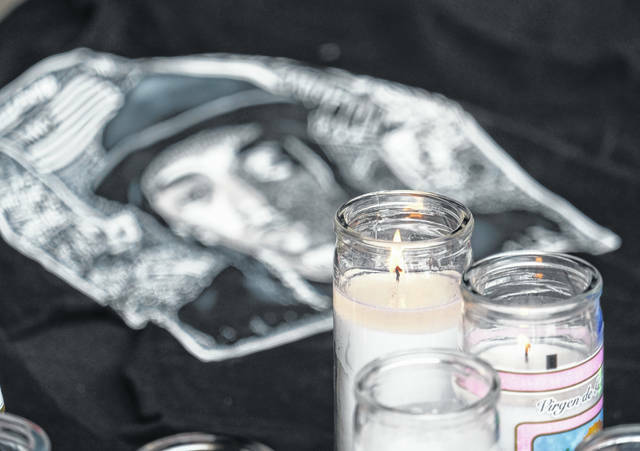 Daren B. Harris waited outside the arena before the doors opened with his grandmother and other family members, who wore black T-shirts with Hussle’s face on them. Harris said he grew up listening to the rapper’s music and followed his journey to improve his community. Harris’ grandmother, Reba Johnson, said she couldn’t miss the occasion to celebrate Hussle’s life. “He was bigger than his music” she said. The 33-year-old Grammy-nominated rapper, whose real name was Ermias Asghedom, was an Eritrean-American father of two. He was a beloved figure for his philanthropic work that went well beyond the usual celebrity “giving back” ethos. Following his death, political and community leaders were as quick and effusive in their praise as his fellow hip-hop artists.